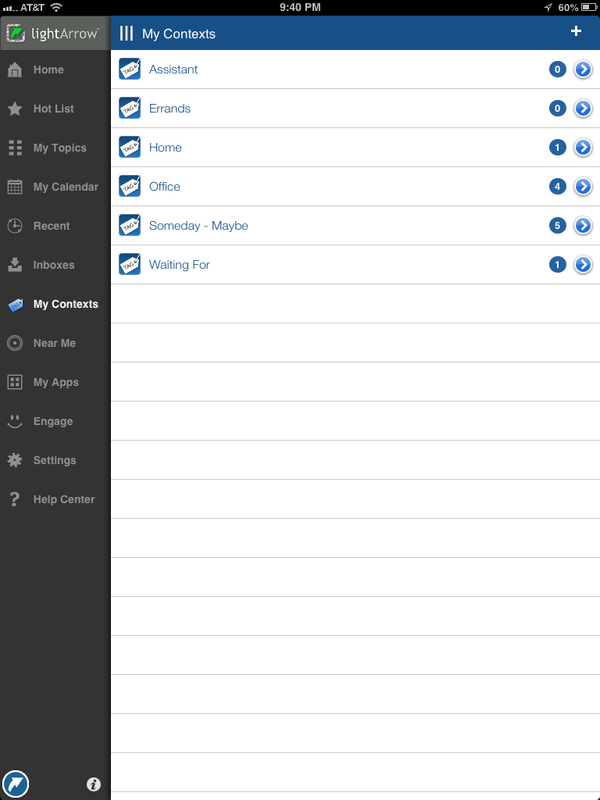 LifeTopix is a personal organization app for iPad, iPhone, and iPod touch. For those who use David Allen’s Getting Things Done® (GTD) method, we’re constantly incorporating features that are useful and we enjoy sharing our best practices in LifeTopix for using them. In this post, I’ll show you how you can use LifeTopix’s features to help you prioritize tasks — influenced by the “Four Criteria Model,” which I’ll explain for those who are not familiar with GTD or this model. If you’re not familiar with GTD, it’s “the groundbreaking work-life management system by David Allen that provides concrete solutions for transforming overwhelm and uncertainty into an integrated system of stress-free productivity,” according to David Allen’s website. How Does One Decide Which Tasks to Complete in GTD? In the GTD method, Contexts are typically based on a physical location, resource, or the equipment that’s necessary to complete a task. Examples of Contexts are @office, @home, @grocery store, @computer, @train, @vacation, or @phone. Also, in GTD, items are allowed more than one Context. For example, you could assign a Context of @office and @phone for phone calls that are completed at the office. Intuitively, many of us take into account the physical location and whether or not resources or gear are available when deciding which tasks to conquer and when to start them. Some activities fall outside of these parameters. For example, processing email on a smartphone or tablet can be performed while commuting as a passenger on the train — not only at the office; therefore, a Context tag of @train can be utilized. To learn more about using Contexts in LifeTopix, see GTD Best Practices for Using LifeTopix. Time available is the amount of time it takes to complete a task or the “effort.” Once you’ve determined that you’re at the proper location and that you have access to the required resources, then you can decide which tasks you can complete within the allotted amount of time. For example, if you must leave the office at 6:00 to catch a ride home and it’s 5:00. You have one hour to complete a task so it’s best to find a task that you can complete in one hour. In order to locate a task that you can complete, then you must assign an estimated amount of time to each task when you’re planning tasks. Some tasks require a lot of brain power and/or physical energy, while others are completely mechanical and you can practically complete them in your sleep. Once you’ve satisfied the Contexts and your task can be completed within your time frame, you can evaluate the energy that’s required to complete the task. For example, imagine you’re a web producer for a corporate website and your job responsibilities range anywhere from adding marketing copy to a website to designing complex web information systems. When brain power is low, you’ll choose the more mechanical task of adding marketing copy, rather than building flow diagrams with proposed designs. The quality of the work is better when your energy level is appropriate for the task at hand. Lastly, take into account the tasks that will produce the most value. How will these tasks help you achieve your most sought after goals and carry out your vision. How will they affect the bottom line? Who will benefit? Are these tasks urgent and why? 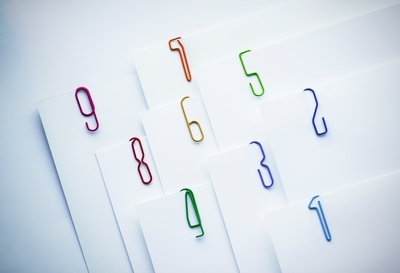 These questions will help you choose the tasks that will move the needle. In LifeTopix, you can create projects, tasks, and to-do lists/checklists. To-do lists/checklists are best suited for very short and simple tasks or items to check off, such as a quality or inspection checklist that’s used over and over again. When planning tasks, it’s best to create projects with associated tasks. Simple Context tags in LifeTopix are shown in the example below. I created location-based and equipment-based Context tags, such as Home, Work and Laptop. I also included Low Energy, Medium Energy, and High Energy Context tags. These Context tags satisfy the criteria of (1) Location and Equipment-based Contexts, and (3) Energy Level. By using the Tasks + Projects topic of LifeTopix, I created an imaginary project for a product launch, called “Product Launch – Lannister” and I created sample tasks, which are associated with this Project. When defining tasks, choose the Contexts that are appropriate for each of your tasks. Additionally, if a person resource is required, you can also choose a person or persons that represent the owner(s). These options are shown in the example below. Also, when defining tasks, ensure that you estimate the effort that is required as the number of hours, and also determine the priority. This satisfies (2) Time Available and (4) Priority. These options are shown below. 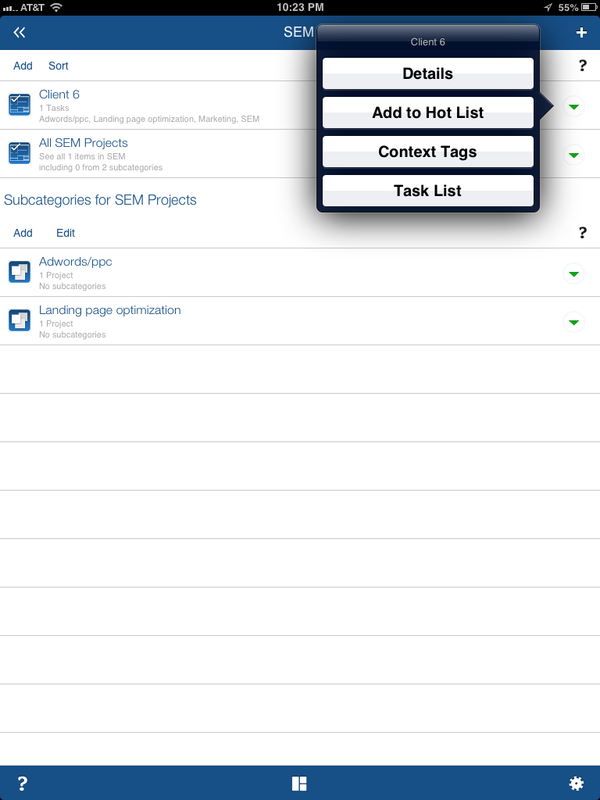 When choosing among tasks, in LifeTopix you can view all of the tasks by their Context by accessing the My Contexts view. For example, you can choose all the tasks that are tagged as Work, Medium Energy, etc., as shown in the following example. You can drill down into each task and make decisions about the tasks to complete based on how long the tasks will take, the priority of the tasks, and if they require additional people resources. Once you’ve made decisions about the tasks you wish to complete, you can assign a due date as shown below. After you assign due dates, upcoming tasks appear in the LifeTopix Agenda view — divided among today, tomorrow, and the next seven days. This allows you to view your tasks among the time-based items that are on your schedule, such as meetings. Alternatively, you can choose tasks among the unassigned items directly from “Open Undated Items” in the Agenda view. For your convenience, you can drill into the details from this view when choosing items you plan to complete. The Agenda View is shown below. 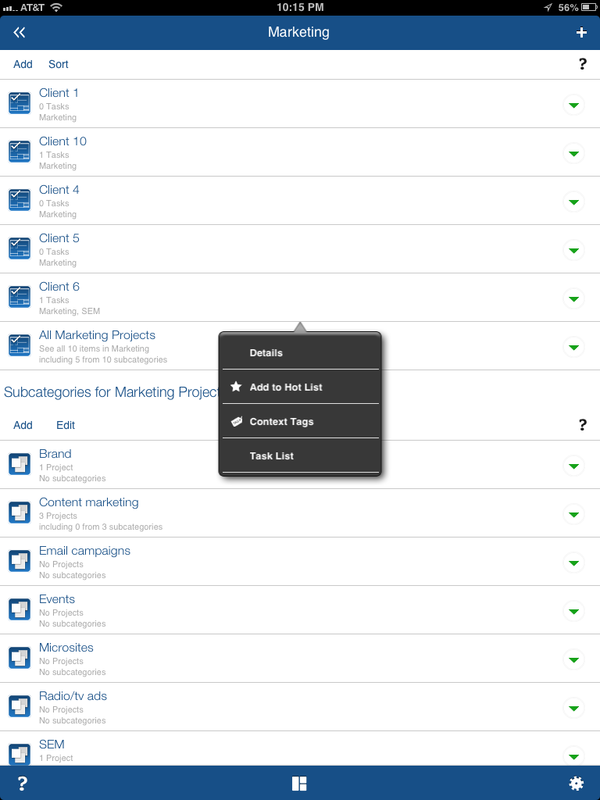 LifeTopix includes several ways to view your lists of tasks. If you prefer not to schedule a time for tasks, you can view the tasks from the My Contexts view, within Categories in the Tasks + Projects topic, or divided among projects in the Tasks + Projects view. You might also choose to add tasks that you’re planning to complete to the Hot List, which enables you to view all the tasks in a single click from the Hot List. Please comment and let us know how you’re prioritizing and choosing tasks. Thanks! The LifeTopix app includes many features to support David Allen’s Getting Things Done or GTD ® method, and it also provides powerful project management features that are essential for those who wish to gain control over their busy personal and professional lives. In this post, I’ll show you best practices for using contexts and best practices for categorization of items — using real-life examples. Categories and Contexts might seem to be similar concepts; however, you will learn that they are applied differently in LifeTopix. GTD has reached the level of a cult following and GTD fans believe the system changes their lives for the better. Many believe that GTD has helped them to do so much more — with much less stress. In GTD, Contexts are typically based on a physical location, resource, or the equipment that’s necessary to complete a task. Productivity is increased when you’re not “switching contexts.” For example, you’re more productive if you return phone calls during blocks of time, rather than switch to a different task — such as graphic design or coding. Examples of Contexts are @office, @home, @grocery store, @computer, @train, @vacation, or @phone. Also, in GTD, items are allowed more than one Context. For example, you could assign a Context of @office and @phone for phone calls that are completed at the office. In Project Management, Categorization allows you to differentiate projects from each other. It’s used to identify a set of items with similar characteristics or properties. Categories can be broken down further into more granular subcategories, supporting a hierarchical approach. There are no official, agreed upon categorization of projects, but suggested categorization is described below. One or more of these could be used to categorize projects. What I’ve found is in the modern world, we have access to our equipment 24/7 via laptops, smartphones, and tablets; therefore, the “Tools Context” seems to be antiquated, unless the tools are very specialized for your job or your company disallows work outside of the office for security reasons. In addition, if you perform all of your work at the office and all of your equipment is accessible at the same time, location-based Contexts might not make sense. As a result, Contexts should be based on your individual situation. You might consider using Contexts based on other attributes, such as @someday-maybe, @on hold, @risk, or @assistant. LifeTopix provides two basic Contexts, which include Work and Home. These location-based Contexts may be modified in any way that you prefer. The following screenshot shows an example of Contexts that you could possibly begin with. Tapping any of the items above shows the details of the items associated with these Contexts. Errands, Home, and Office are location-based Contexts. They allow you to separate your work and personal life, and to also group errands that need to be run while you’re on the go. Someday – Maybe is a list for your creative future plans that you don’t have the time or resources to pursue at the moment. When you have a great idea that comes to mind, you can assign the Someday – Maybe Context to it so you won’t forget it when the perfect time comes along to get going on those projects. Waiting For is the list of items that you cannot complete because you’re blocked in some way. For example, your TPS report may be due; however, you’re waiting for the new cover sheet. Consequently, you would tag it with this Context. This way, you will make sure to follow up on these items before they become overdue. Assistant is a Context for items that you can delegate to another resource. This will remind you that you can take these items off your plate, but also that you need to ensure they’ve been completed. 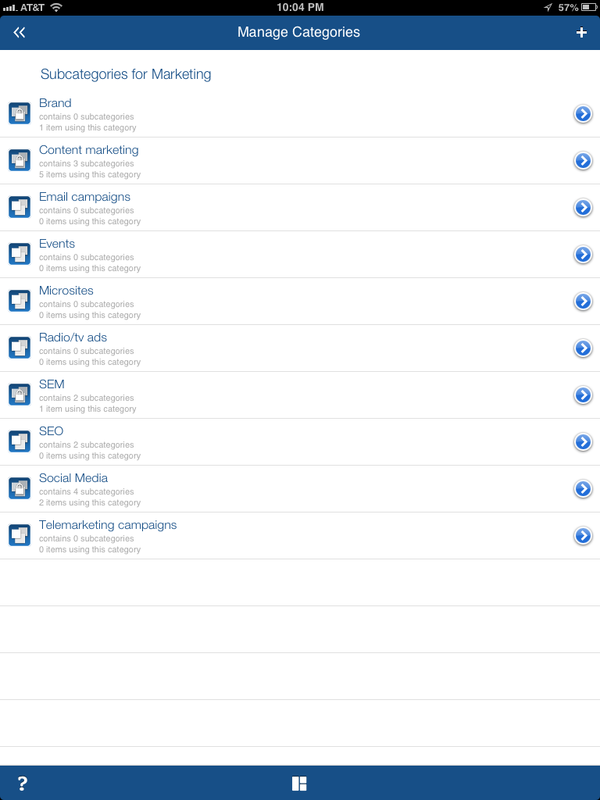 LifeTopix also supports a Quick Inbox (with Soon and Someday categories) for ideas you want to capture quickly. You can use this as a placeholder, and process these items later and apply the proper Contexts. These items can be quickly converted to Tasks, Notes, Appointments, Reminders, Projects, Trips, Visitors, Events, Shopping Lists, or Gifts for Others. You should note that in the current version of LifeTopix, you can only assign one Context to an item. In a future update, you will be able to assign multiple Contexts to each item. Categories and subcategories are very powerful in LifeTopix. The number of subcategories are limitless, but Project Management best practices experts recommend that you keep the number of subcategories to no more than three. Projects and Tasks share categories and subcategories. Once your categories are set up and you’ve assigned categories and subcategories to LifeTopix projects, in the Tasks + Projects topic you can view all of the Marketing projects for which the categories and subcategories have been applied. In this example, projects are created by “client” so you can easily see which services/products have been agreed upon by each client. For each client’s project, you can also attach all supporting documentation (bookmarks, files, audio, photo, video, notes, expenses, services); actions (tasks, checklists, shopping items); and schedules (appointments and reminders). You can view a screenshot of the projects and their subcategories below. And when you tap one of the Categories or Subcategories, such as SEM, you can easily view additional subcategories that were created for more granularity (such as Landing Page Optimization and Adwords/PPC, which are sub-components of SEM). You can also view which clients’ projects these services/products apply. You can see an example of this below. As you add items throughout LifeTopix, you will see how important it is to leverage the Category fields. For example, you’ll be able to better locate, evaluate, plan, and resource projects and other items that you’ve created in LifeTopix based on their categories. When viewing the history of your projects, you might identify that some categories of projects contain more risk than others and that some projects yield more payoffs. And projects of different categories require varying sets of best practices; therefore, applying categories will help you choose the appropriate documentation. Categorization will help you make future decisions based on past performance. Now that you understand the differences between Contexts and Categories and how to leverage them in LifeTopix, it will be easier to initially set up LifeTopix to support GTD. And as you use LifeTopix and GTD more and more, you will find LifeTopix is flexible enough to add new Contexts and Categories as you progress. Keep in mind that Contexts apply to Assets, Events, Gifts, Notes, Persons, Projects, Services, Service Providers, Shopping Lists, Subjects, Trips, Visits, Appointments, Audio, Bookmarks, Checklists, Expenses, and Files — not just projects and tasks. Categories apply to Assets, Bookmarks, Events, Expenses, Notes, Products, Projects/Tasks, Service Providers, Services, Subjects, Log Entry Units, and Shopping Item Units. This enables you to apply project management techniques to everything you do in your life — resulting in a more efficient, happy, and productive YOU! Please comment on how you use Contexts and Categories in LifeTopix or other GTD and/or Project Management tools. Overthinking, analysis paralysis, brooding, reflecting, deliberating — whatever you call it, it’s the nemesis to productivity. Have you considered using a productivity system such as David Allen’s Getting Things Done (GTD), but you feel overwhelmed and paralyzed before getting started? Do you debate whether the system is right for you? GTD works great for many people and they swear by it, and others believe it’s too complex or limits their creativity. Productivity systems should be based on personal motivation, needs, and objectives. It’s important to find the system or tool that’s right for you — and sometimes this means starting small or inventing your own system by using a variety of best practices. And if you find you’re spending more time managing your system than getting things done, it’s time to simplify or re-think it. To help you get started with the basics, we’ve created this quick summary. Keep reading to be up and running without the overhead and expense of a heavy productivity system — no seminars or training sessions — just practical advice. Productivity gurus, such as David Allen, have coined the term “ubiquitous capture” for the practice of capturing everything. The idea here is to always carry some sort of tool to capture ideas, to-do, messages, diagrams, notes, etc. because we simply can’t remember everything. There’s several tools for capturing these items from a simple notebook, index cards, a journal, a note-taking app, to an all-in-one organization app, such as LifeTopix. This is fundamental to productivity success, and it also helps you remember and act on your spontaneous creative ideas. We recommend to go even further, and categorize these items. Associate these items to their value — whether it is emotional, strategic, creative, tactical, health-related, etc. This will help you determine their importance within your life. 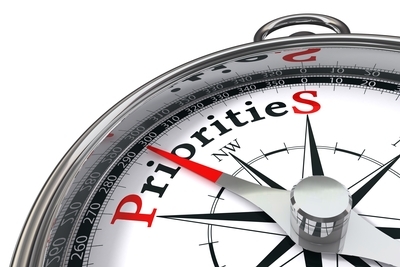 Knowing what’s important, rather than urgent is essential to move the needle forward. For example, imagine you’re in charge of Engineering at a large corporation and there’s a need to develop an innovative, new platform that’s a gamechanger in the industry. You know this project is an essential element to success. If you’re a leader and you ignore this objective and instead jump on small tactical improvements, you’re putting urgency ahead of importance. Or perhaps, you’re a mom raising young children. You may feel that it’s urgent to vacuum your house every day, but the importance of reading books to your children will certainly pay off in the long term. Scheduling uninterrupted time every day, week, or month to knock out these big projects will help you move the needle to achieve your most important goals and objectives. Mark Twain wrote, “The secret of getting ahead is getting started. The secret of getting started is breaking your complex overwhelming tasks into small manageable tasks, and then starting on the first one.” This seems obvious, but many of us fail to break these big projects down into manageable, actionable tasks — and the result is procrastination. 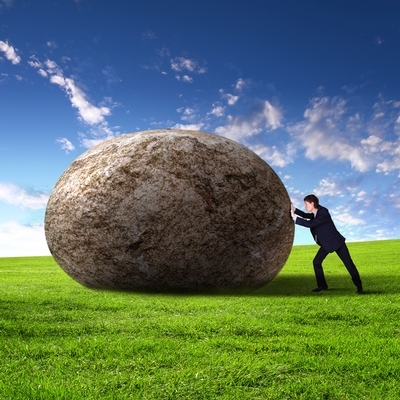 Large projects seem daunting and it’s difficult to get started. For example, imagine you’re planning a pool party and you need to prepare the swimming pool for the event. Perhaps you’re having a hard time getting started. To fully understand the scope of the project, the tasks you can delegate, the length of the project, and the tasks you can let slide, it’s important to break the project into manageable chunks. When you consider everything that needs to be completed for the entire party, this list gives you the information to make smart decisions about outsourcing, delegating, and letting some tasks fall to the wayside. A to-do list is a list of tasks to complete within a specific period of time. The most important items should be listed first. Project management professionals recommend applying the 80/20 rule or “Pareto Principle” to many elements of business — including your to-do lists. In the early 1900s, Italian economist Vilfredo Pareto created a mathematical formula that described the unequal distribution of wealth in his country. He observed that approximately twenty percent of the people ruled eighty percent of the country’s wealth. In the 1940s, Dr. Joseph M. Juran, a management consultant, attributed the 80/20 Rule to Pareto, calling it the Pareto Principle. When applying the Pareto Principle to productivity, it reminds us to stay focused on what matters the most. For example, consider the above example for preparing the swimming pool. Using the Pareto Principle, theoretically, approximately two of those tasks are of high value. If you choose to complete those two tasks, you’ll get a much bigger return than if you’ve completed several of the lower value tasks. Whatever tool you choose, make sure you capture everything in one place. It’s important to use one app or platform that’s the hub or single point of access for all of your data. Without this, you’re wasting time locating the information you need. For example, if you’re using five different iPad apps for your productivity system that aren’t integrated or associated, your constantly searching for information and the data is presented out of context. When data isn’t related, it’s difficult to locate trends, such as a relationship between practicing meditation and improved productivity. A calendar is best suited for time-based items, such as appointments and events; and many productivity experts believe that to-do lists should be kept separate from your calendar. Using a combination of both a calendar and a to-do list is ideal because they serve different purposes. Your tool should allow you to create a to-do list separately from your calendar, but present it on your calendar if you choose to do so. Another tactic for using your calendar efficiently is to block off time for focusing on your tasks or projects. When colleagues schedule meetings, they will see that you’ve blocked off that time. Make the most of it — keep a journal to help identify the productive times of the day and schedule these blocks of time to complete your list of to-dos. These productive times can be based on your children’s nap times, your natural rhythms, the slower times of the day at the office, or other environmental factors. There’s many ways to reduce distractions, but they vary depending on your life. If you’re at home and raising children, managing distractions might be more difficult because the day can be quite unpredictable. Regardless of your situation, journaling to learn the natural rhythm of the day will help you find the best times for working on your projects. During this time, if your situation allows it, turn off the phone ringer, shut down email and social media notifications, and resist from surfing the Internet or watching television. Focus for 90 to 120 minutes, and take a 20 minute break. See our post about Ultradian Rhythms for more information. If you work from home, make sure you work in a quiet, solitary place. Consider if you’re out of sight, you’re also out of mind and less likely to be interrupted by family members and pets. At the office, shut your door or wear headphones to signal that distractions aren’t acceptable. Let your coworkers know when you’re not available for discussions or socializing. We hope this helps to get you started with a productivity system in no time. Please comment and let us know your top tips for getting up and running quickly.